While I am very aware of the existence of the band, Gong, especially having reviewed Steve Hillage releases as Steve was a member of the band in the early days. What I was not aware of was the fact that the band is still on the go. I See You is a new release and makes the number of studio albums released by Gong now reach 23, from the debut album in 1969, Magic Brother, to the previously issued release, 2032, out in 2009. 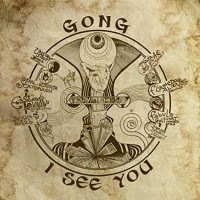 This new album, I See You, will delight the die-hard fans of the band, Gong, but the information also recently released on the website will have been devastating. Original member, Daevid Allen, who contributes gliss guitar and vocals, had indicated that he had a terminal illness with only months remaining and just passed on March 13th. The band for the recording of I See You comprises Daevid Allen, Orlando Allen (drums, vocals), Dave Sturt (bass, computer samples), Kavus Torabi (neoprog smart guitar), Fabio Golfetti (guitars) and Ian East (saxophone, flute). Kavus Torabi is also a member of the band Knifeworld, and also joining as guests on the album are Gilli Smyth (sprinkled space whisper) and Mark Robson (keyboards). I See You is a 12 track album with a total playing time of around 63 minutes, with consecutive tracks, numbers 10 and 11, “A Brew Of Special Tea” and “Thank You,” being the shortest, and longest, at 1:22 minutes and 10:35 minutes respectively. An interesting aside is that the members of the band were recording in different places, Australia, Brazil, Israel and the UK, and then the results seamlessly merged to produce the 12 tracks on offer. The opening, and title, track, “I See You” (3:24) opens with some spoken word passages and a distinct jazzy feel to the music. The vocals put me in mind of the style of David Byrne (Talking Heads) and the track merges horns, guitars and synth swirls in a fairly pleasant, in unremarkable, manner. This is an easy going track to set the album in motion. “Occupy” (2:51) almost shouts out “King Crimson,” with some frenetic horn work and sudden unexpected time changes which certainly kept this listener on his toes. As the track moves into its fade-out sequence, it is awash with Gilmour/Floydian style sounds. Track 3, “When God Shakes Hands With The Devil” (5:36) has almost rap-like vocals and the excellent drumming, guitars and flute contribute to a very interesting track. “The Eternal Wheel Spins” (7:07) has a soft spoken intro by Gilli and then proceeds to drive along in a manner not unlike an in-form Hawkwind. Some amazing guitar from Fabio is a real highlight of this track and its 7+ minute length seems to fly by. This is my personal favorite track from the first third of the album. “Syllabub” (4:30) is one of those “stop-start” musical pieces which really never grabbed this listener. The constant time changes prevented the track from flowing. “This Revolution” (3:44) is a hard hitting diatribe on revolution set amidst horns and a “spacey” style background. “You See Me” (3:44), which is possibly linked to the title track, shows the King Crimson style again, especially with that bands characteristic time shuffles. A change of style sweeps in with “Zion My T-Shirt” (6:09) with some excellent choral styled chanting setting the scene. Subdued drumming, subtle guitar and a set of breathy styled vocals make for a very atmospheric track. The longish spoken section of lyrics sits within the track well. Next up is a real piece of whimsicality with “Pixielation” (4:43). The sections within this track are separated by very atmospheric music, and the result is a very clever track that embeds itself in the mind. The very short “A Brew Of Special Tea” (1:22) is a mainly sound effect track with an old style radio type vocals in the background, but grabs the listeners attention. The longest track on offer “Thank You” (10:29) is one of those hypnotic drone style tracks which builds in intensity very slowly with some excellent synth guitar. Just prior to the 4 minute mark, the track becomes very sparse, before building again with some more excellent guitar, but I did find that the “atmospheric” sounds in the background proved more of a distraction than adding to the soundscape. This section seems a little too long, going on as it does to around the 7+ minute point, before the track moves into a simple chant like vocal, but the magic generated by the first 4 minutes seems to have vanished. This genuinely sounds like the final track of an album so it is interesting to see how the band do close the album. “Shakti Yoni and Dingo Virgin” (9:32) veers in another direction, being built up of atmospheric and ambient soundscapes, instrumental in nature, apart from the “sprinkled space whispers” supplied by Gilli. I See You is an album that will sell well to Gong enthusiasts, as here we have a band that, while recreating some classic Gong style music, have refused to simply “go through the motions.” There are huge hints at the contents of some early classic Gong albums, but the motivation and enthusiasm of the musicians involved ensure that this is a “new” Gong. I See You could also pick up sales from music aficionados keen to sound out Gong, and several listens to this album could well see them search out early back catalogue material.